Jacob Cushing rebounding against Chestnut Hill College. Cushing posted the second-highest point total of his career. 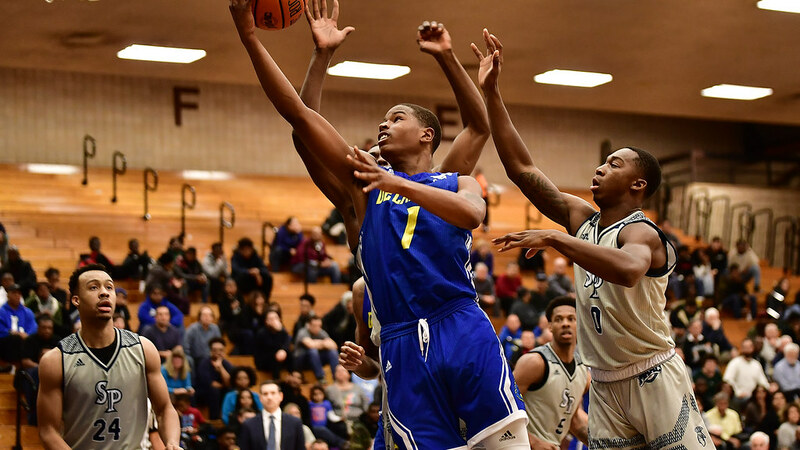 Delaware won in a landslide against Chestnut Hill Tuesday in its first home game of the season, shutting down the Griffins 100-62. 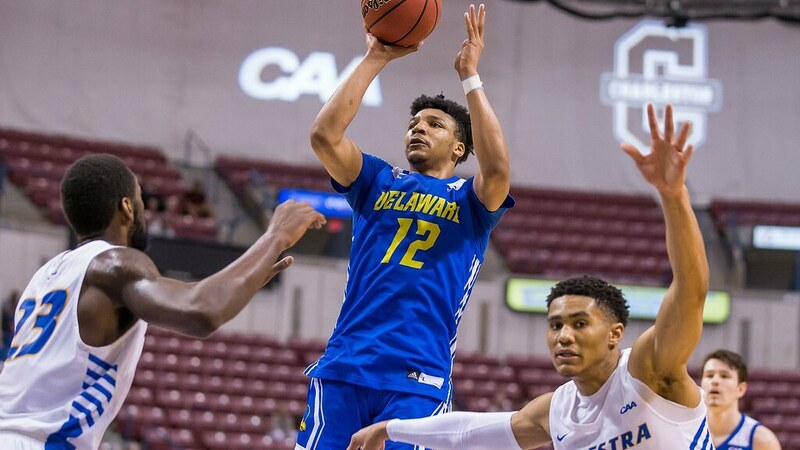 Both teams came into the game with a 1-1 record, but Delaware reigned supreme following its overtime victory against Saint Peter’s Saturday, spending over 37 minutes of the game in the lead. In the first 10 minutes of the first half, neither team had a serious advantage, until Delaware’s defense was able to hold the Griffins to 16 points over the next four minutes, while gaining 13 themselves. A 23-2 run through the later portion of the first half keyed a 50-28 halftime lead. Once the Blue Hens gained momentum, Chestnut Hill’s defense could not contain them. Delaware made 35 of their 64 shots, scoring almost 55 percent of their shots — the best shooting percentage they’ve had as a team this year. Bryant, sophomore guard Kevin Anderson, redshirt senior forward Eric Carter, junior forward Jacob Cushing and freshman guard Ithiel Horton all scored in the double digits. And let it fly they did. Bryant led the Hens offense, scoring 18 points on the night, including three makes on four attempts from three. Delaware shot 11 for 25 as a team from outside the three-point line. Not only was Delaware able to shoot well, but they were also able to work the ball around well as an offense, using smart and effective passing to pick apart the Griffins’ defense and create more open shots. The Hens had 18 assists, double Chestnut Hill’s nine, proving their effectiveness to work together as a team. 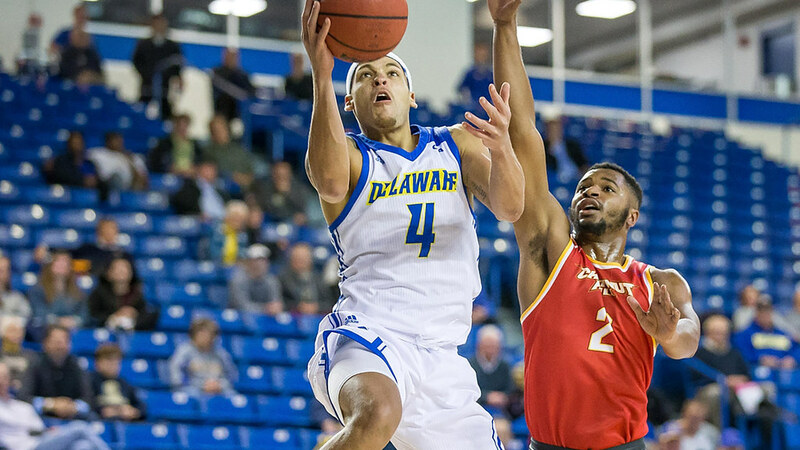 Delaware held Chestnut Hill to only 24 made shots of their 75 attempts (32 percent). Delaware played well on all sides of the ball and their efforts paid off, shutting down the Griffins’ offense and performing exceptionally as a team on offense. The Hens will be heading to Ithaca, N.Y., for their next game at Cornell on Thursday at 7 p.m., before returning home to face Wilmington University Sunday at 2 p.m.